Billions of images have been analysed for this design forecast. Can you believe we're halfway through the first month of 2019 already? If you're feeling like time is passing you by, this creative trends report from Shutterstock should help you keep on top of what's going on in the world of design. In its latest annual report, the technology and stock photography company has analysed billions of image, video and music searches and downloads from its vast customer base. With this wealth of data, Shutterstock has been able to single out 11 styles that are set to influence and shape design throughout 2019. From its research, Shutterstock predicts that the aesthetics of yesteryear are set to make a comeback. An '80s look of decadence and overindulgence is in, while cute kawaii illustrations and tempting typography are also due to hit the big time. It's not all nostalgia and retro fonts though, as trends like Beyond Plastic highlight urgent environmental issues. What’s old is new again. This trend is an optimistic redux of early-tech – a focus on what yesterday’s tomorrow looked like. It’s all about the looks and sounds that defined futurism at the dawn of the digital age, like purple, blue, and pink duotone gradients, basic vector graphics, and dreamy synth music. In the digital age, zine culture lives on in the decentralised mindset of social media, where independent makers can share and niche groups can discover. Built on principles of collage and largely influenced by the invention of the photocopier, it’s paper cutouts, noise and grain textures, and rough-edged layers that define this trend. The ‘80s is back and it’s ready to party with gold chains, animal prints, and attitude. We say forget good taste, this is about good times. Clashing is the keyword for this trend. Think leopard print and snakeskin, peacock feathers and gold chain belts, soft fur and hard metal textures. "Even the most talented creative professionals sometimes want a little inspiration for their next big project and our Creative Trends report is here to help," says Lou Weiss, global Chief Marketing Officer of Shutterstock. "With over 1.5 million fresh new assets added weekly and millions of searchers using our platform, Shutterstock has volume of search and download data to predict the hottest trends and newest fads being driven by the design world. 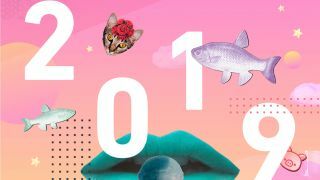 "We can’t wait to see these 2019 design themes come to life everywhere, from ad campaigns, to the catwalk, and in movies. This year, our top three trends are influenced by the bold design principles of years past, so it will be particularly interesting to see how they evolve with modern interpretations best suited for today’s digital platforms." Check out the trends set to dominate 2019 with the report below.